Bird Flu Flies Again, Prompting UN Advisory : Shots - Health News The United Nations' Food and Agriculture Organization warned of a "possible major resurgence" of H5N1 influenza, including a mutant virus that appears to be unfazed by available vaccines. 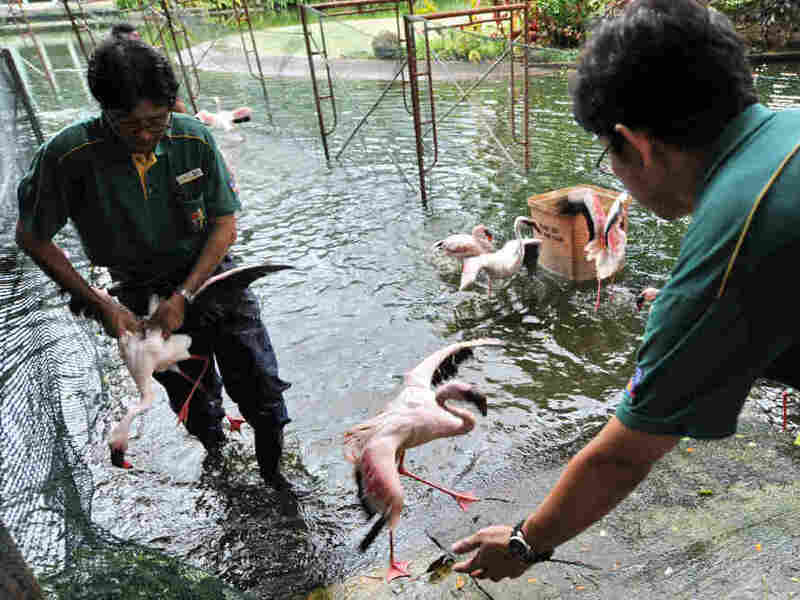 Workers at the Jurong Bird Park in Singapore catch flamingos last year as part of a drive to vaccinate them against avian flu. Out of the public eye, the bird flu has been making a comeback. The United Nations' Food and Agriculture Organization warned today about a "possible major resurgence" of H5N1 influenza, including a mutant virus that appears to be unfazed by available vaccines. The latest fatality from the infection occurred in Cambodia earlier this month. A 6-year-old girl became the eighth person to die from avian flu there this year, the World Health Organization said. In 2003, the H5N1 virus that usually affected only birds was passed from birds to humans. Spread of the virus from human to human remains rare, but a mutation that would make the lethal virus easily transmissible from one person to another would raise an even bigger hazard to public health. The culling of hundreds of millions of domestic poultry helped eliminate the avian flu virus in most countries where it had been found. But the virus has remained entrenched in a half-dozen countries, including Vietnam and Indonesia, the UN's Food and Agriculture Organization says. Now migrating birds appear to be spreading the H5N1 virus to countries where it hasn't been seen in years. "Wild birds may introduce the virus, but peoples' actions in poultry production and marketing spread it," FAO Chief Veterinary Officer Juan Lubroth said in a statement. So far this year, the WHO says, there have been 49 human cases of avian flu reported, resulting in 25 deaths. In all of 2010, there were 48 cases and 24 deaths. The FAO called on countries to step up their surveillance and preparations against the avian flu. Lubroth has sounded the alarm about H5N1 before. "As long as it is present in even one country, there is still a public health risk to be taken seriously," he said in April 2010.